So it is that time of year when a routine of work, exercise and play has begun to flow and you really start hanging out for your weekends to sleep in and enjoy the crisp coolness and warm sunshine that autumn brings. Well this is us right now. In the past couple of weeks we have had many long weekends here in Argentina. Our aussie friends and family can't quite comprehend how come we have so many long weekends- Argentina likes to respect and celebrate their special days of memorials, liberty and reconciliation and Easter... so the government and lady president 'Cristina' gives everyone an extra 1 or 2 days off so they can go away on a mini break. We ain't complaining here! So what have we been up to? Well over March it was getting back into a flow of working. Chris has started his new position in the school as the prep school music teacher (primary school) and is truly loving it! It's awesome to see Chris in a roll of leadership and creativity again. And I am spending lots of extra hours rehearsing with students for mamma mia, running choir ensembles, trying to squeeze in lesson planning, preparing kids or exams- busy busy busy little bees we are! 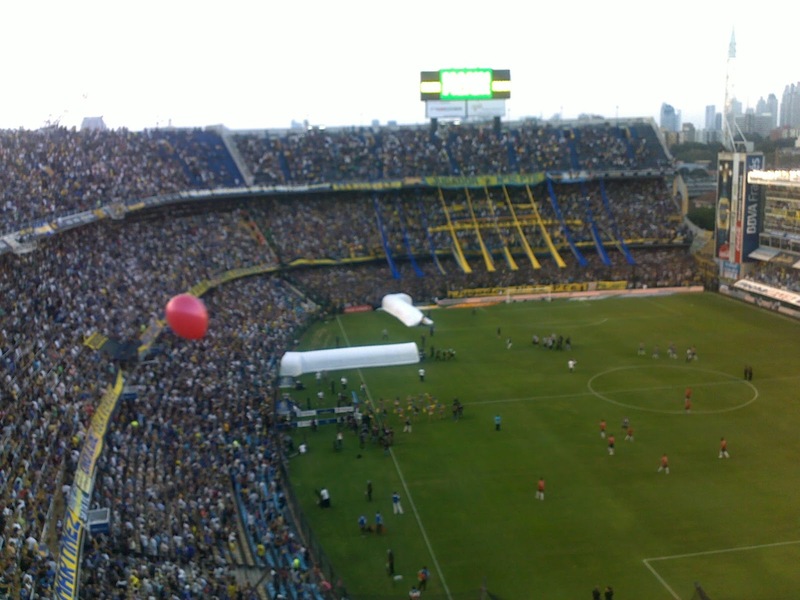 A very full and exciting stadium- La Boca! We took Mim to local food markets here in Quilmes- some good asado feasting- markets in Capital and the highlight was La Bombanera. We saw a futbol game in THE stadium at Boca! 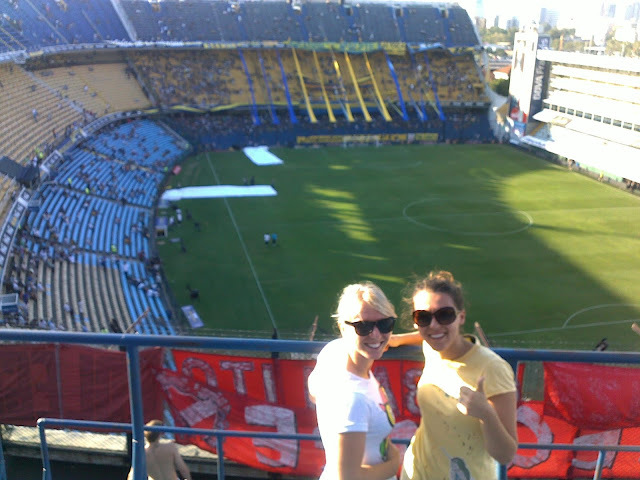 Watching Boca vs Independiente! We were in the visitors seats (Independiente) right up the top and was right in there with the away fans! and the away team won and I can't even describe how amazing the whole night was!!!!! It was one of the craziest and coolest experiences ever!!! being squashed and hug by crazy happy fans and the colourful language that was being used to put down the opposite team and the huge flag coming over us and the game was one of the best most intense futbol games ever!!! it was fantastic and the photos just don't do it justice!! It was amazing Mim got that experience!! 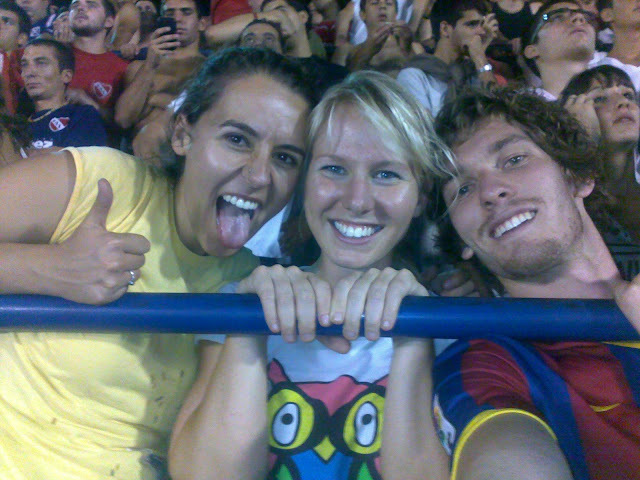 and it was my first time seeing a game in La Bombanera!! EPIC is the word to use for this experience! So Mim left us on a huge high note and started her adventure, and we continued as normal, working and weekending. So now we are saving our pennies so we can book our huge summer vacation to NYC, New Orleans, Orlando (disney land and universal studios), Miami and 3 weeks in Mexico! this is the idea, but saving saving saving!!! Easter Chicken?! No I think it is a Guinea Fowl? So Easter, today is Easter Monday- we had 5 days off over the weekend and we didn't go anywhere, we haven't even been into Capital (saving pennies)... we slept in, watched movies, cooked good food, hung out with friends, had picnics, relaxed and feeling really good!! was such a recharging weekend!! pumped to knock over the next 3 weeks and then head to Peru! At Zoo Lujan- Very beautiful tigers! I was very close to this tiger! But we went with our friends and had an awesome picnic with their family and just walked around all afternoon in the perfect weather experiencing a different kind of zoo... the animals weren't mistreated.. but they weren't respected or looked after well either... It was sad to see, but we just enjoyed the company of our friends and I went a bit snap happy with the camera. Just want to send a big Happy Easter love to my family and friends and will be updating soon with news after Machu Picchu!!! !